Several RepRap extruders use compression coil springs to provide tension on the idler. While some companies exist that manufacture springs locally, they are not really conveniently located and might charge a lot if you are only interested in small quantities. 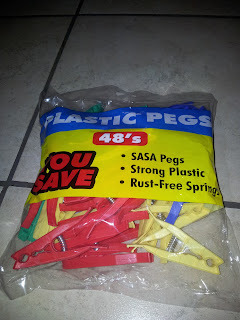 After search the internet and fastener / hardware stores unsuccessfully, I happened to notice that certain clothes-pegs have springs that seem perfect for the job. The pegs themselves seem to be made from PE and might be recyclable into filament with a filament extruder. This thread on the RepRap forums seem to mention the same springs.